Space-age Kleen Koat porcelain stick-free for easy clean up. Dishwasher safe. Compact size 8-1/2" x 13" x 1-1/2". Perfect for campers, boats, select toaster ovens, and smaller ranges. Ideal size for cakes, desserts, lasagna, etc. COOKING DONE RIGHT: Make the perfect meals with the help of the Range Kleen BP106X 2 Piece Heavy Duty Porcelain Broil and Bake Pan. Whether it is broiling meats to perfection or baking dishes, cook with ease with this 2-piece utensil. MADE FROM HIGH QUALITY MATERIALS: Heavy-duty porcelain on steel grill and base, this USA made set is safe for use for up to 1025 degrees F and has OEM (Original Equipment Manufacturer) quality. GOOD FEATURES FOR BROILING AND BAKING: The grate of the grill allows fat drippings to drain away from meats. The Range Kleen BP106X is suitable for use on an outdoor grill and perfect for fish, meats and veggies. COOK AND CLEAN WITH EASE: The materials are easy to clean and dishwasher safe. A WELCOME ADDITION FOR ANY KITCHEN: Dimensions: 12.75" by 8.5" by 1.325". 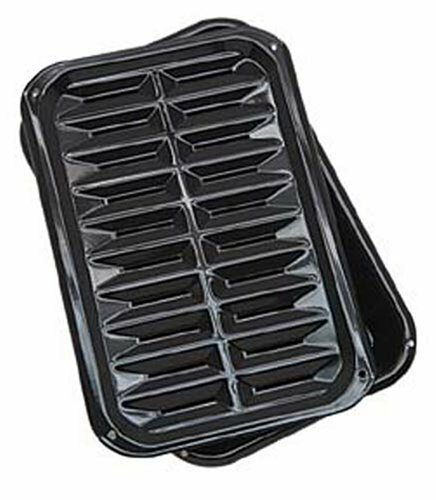 The Broiler pan can be used as a baking dish. If you have any questions about this product by Range Kleen, contact us by completing and submitting the form below. If you are looking for a specif part number, please include it with your message.